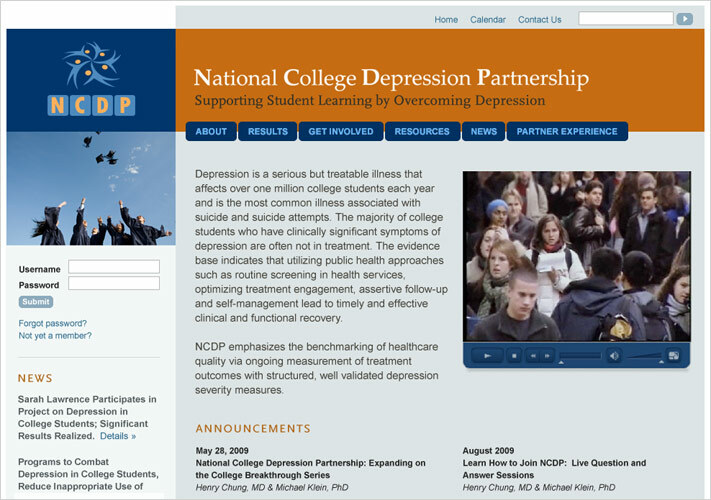 The National College Depression Partnership (NCDP) is a college health care consortium designed to help clinicians recognize and improve the treatment of depression among college students. The consortium, based at New York University’s Student Health Services, brings together university medical and counseling leaders from over 20 college health centers to work together to demonstrate the impact of evidence-based assessment and treatment practices on depression identification and treatment in college health. NCDP contracted Cabengo to architect, design and develop its current website to include a CMS-driven public website and a CMS-driven password-protected online resource center. The two websites share a common graphic theme and backend but address the needs of distinct audiences. Both are easy to navigate, with clear labels and intuitive paths to information for key audiences. The look and feel is fresh, uncluttered, and professional. The CMS allows non-technical staff to update and edit content. An advanced resource search allows authorized users to search across categories and topics.